Greetings <<First Name>>, welcome to this week's newsletter! We have been talking a lot lately about Give and Take (largely as it is the lent series we are following) but this week it is all about giving. I just want to share a few examples. This wednesday my usual support (Philip) was away in Kent so I had to do Street Church on my own. I have to admit I was a little concerned about setting up and was even thinking I might need to do "Street Chapel" (pictured above) as I did when the winds were high. However, when I arrived at the Old Steine a few of the people I see during my chaplaincy in the morning came early to help. These street guys (and gals) pitched in and had everything up and ready in no time. Then as the afternoon went on people approached me asking if they could help in the future, offering to give their time freely to support this engagement with the street community. Incredible how people's attitudes change when they see the guys just coming over and helping without being asked, freely giving time and effort, then wandering back to their somewhat chaotic lives. It is something that I am always thankful for, this opportunity to change peoples preconceived notions about street people just taking. Given the opportunity they will give as much, if not more, of their time, of themselves, to something they see as worthwhile. This week Andrew spoke to us, in our third Give & Take sermon of Lent. Click here for our YouTube channel to hear more! There is a chorus to a well-known song called 'Blessed Be Your Name' that less reverent people than Andrew & myself might replace the first line of with, "you give us take-away, you give us take-away"...! However, listening to that being sung by someone who shall remain nameless...reminded me of a term that some preachers use, the "sermon take-away", that is, the lesson that is to be learned, or the point that is to be remembered. I shall be preaching this Sunday and one of the few 'rules' that MCC Brighton has is that sermons are to be personal, to be less a "thou must believe this because I said so", and more a "I believe this because...", in the hope that such a sermon encourages those listening to develop their own individual relationship with the Divine. Churches can often be a place where people go to be told what to do and what to believe, and woe betide anyone who questions the church leaders...especially the minister! What churches should be, in my opinion, is a place where lovers of God, and followers of Christ, can learn more about the Divine, and their relationship with the Divine. A place where we can grow, and expand our minds. Rather than a place where our souls languish, lie dormant, and stagnate. The take-away I hope you've received from this is that your relationship with God is personal to you, and not something that can be dictated by others. God gave us their Son to take away all barriers between us and the Divine...including those created by humans. Lord God, your hand has touched the dry bones of our faith, your Word has breathed new life where there was death, your Spirit raised us up from where we lay, your love has brought us home, and by your grace we stand forgiven, free. Thank you for all that you give, and we pray that we would have the strength to take your gift to all the world. All this we pray through your mighty name. British Summer Time- The clocks go forward in the early morning, so don't forget, or you'll be late for church! Community Lunch- Every Sunday a lunch for the homeless and vulnerably housed is provided by one of the City’s Churches. When there is a 5th Sunday, we help Dorset Gardens Methodist Church with cooking, serving, cleaning, and socialising. If you are interested in being involved please contact Andrew. Worship Service- Brighthelm Gardens, 6pm. We will be continuing our series exploring Easter, called Give & Take, and Philip will be speaking to us. Click here for the flyer, do invite your friends! Pastoral Availability- Mondays are Andrew's day off. This means that he is not available by phone or email. 'Meet The Candidates Webinar'- At 5pm the 3 Moderator candidates will be hosting an opportunity for us to ask any questions we may have about their suitability. The webinar will be held here. The Hub- Salvation Army Congress Hall, Park Crescent (by the Level), 8.30am until 1. An advice & support chaplaincy for the homeless & vulnerably housed, with free food. Volunteers always needed. Street Church- Old Steine Gardens. 4pm until 5.30. Informal worship & communion for everyone. Help with setup from 3.30 always appreciated. Community Office Hours- Alcampo Lounge, London Road, 12pm until 5. Pastor Andrew is available for advice, chat, and prayer. Please contact him first as he does get busy! Bible Cafe- Every Thursday evening we hold an informal and friendly Bible study, where all are encouraged to take part in the discussion. Contact us for more details! Pastoral Availability- Pastor Andrew is undergoing an operation and is not available by phone or email. Following this he will have limited availability for at least a week. Please do allow him recovery time. Best wishes & prayers always welcome though! Street Church Hastings- Wellington Place, Hastings, 4pm until 6. 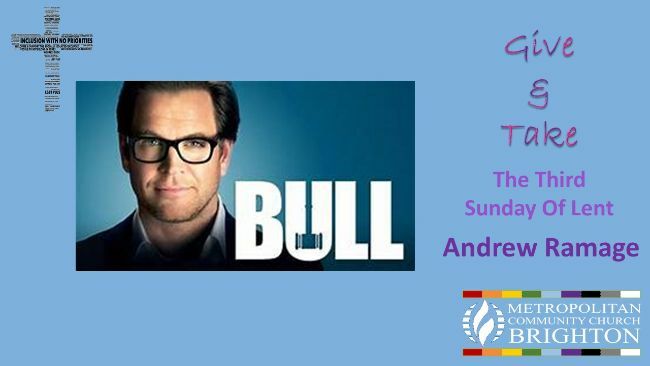 BRightOn Festival Showcase- This is an event for members of Brighton's LGBT+ charity sector. We will be hosting an information stall and giving a short talk about the work that we do. Speak to SJ if you are interested in attending or helping. Worship Service- Brighthelm Gardens, 6pm. We will be continuing our series exploring Easter, called Give & Take, and SJ will be speaking to us. Click here for the flyer, do invite your friends! Community Office Hours- Following his operation Pastor Andrew will not be holding office hours this week. Board Meeting- Alcampo Lounge, London Road, 5pm. This is an open meeting and all are welcome to observe. HisPlace Community Church Easter Craft Sale- Robertson Road, Hastings, 10am-2pm. One of our Hastings volunteers is holding a Craft Sale at their local non-denominational church. 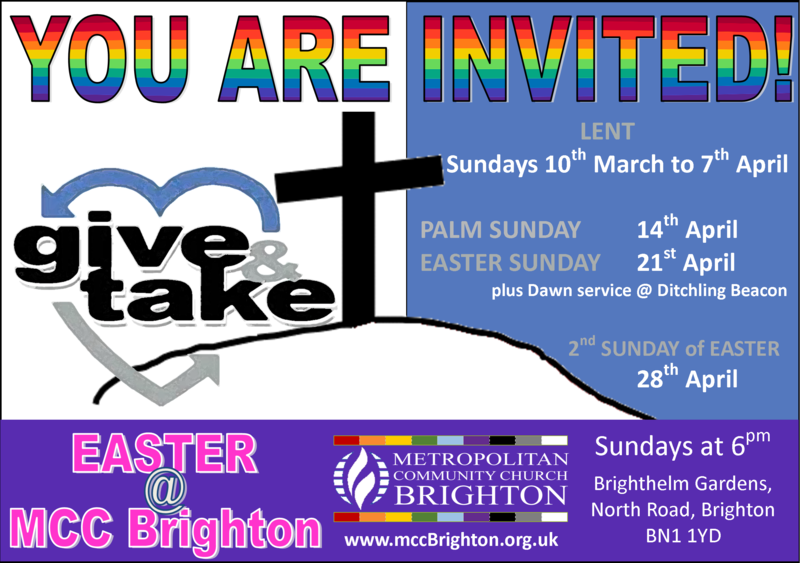 We will be joining her and taking along information about MCC Brighton's work in Hastings and beyond. Do come along and support us and HisPlace. Easter Sunday- Ditchling Beacon. We will be holding a short sunrise service which will be followed by a light breakfast. If you are interested in attending but need transport please speak to Philip or Andrew. Copyright © 2019 MCC Brighton, All rights reserved.